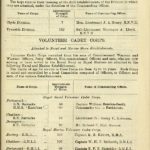 The Volunteer Cadet Corps was first formed on 14 February 1901 at the Mission Hall, Prince Albert Street, Southsea. The first Commanding Officer was Captain Harkness RMA and the first parade night was held at the now former Royal Marines barracks in Eastney, Portsmouth. The Cadet Corps was formed, so the story goes, to “gainfully occupy the spare time of sons of senior Non-Commissioned Officers” after one occasion when the colonel’s office window was broken by a ball kicked by an SNCO’s son playing outside. Other units, all Royal Marines Cadets, were formed in 1904 at Plymouth and Chatham, and the first Royal Naval Cadet unit in the VCC formed at HMS Victory barracks (now HMS Nelson) in Portsmouth. 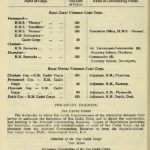 The VCC has always been sponsored by the Royal Navy, as the extract from the 1913 and 1945 Navy Lists show. Throughout the 20th Century the VCC expanded with units being established in HMS Collingwood (Fareham), HMS Daedalus (Lee-on-the-Solent), HMS Dolphin (Gosport), HMS Dryad (Southwick), HMS Excellent (Portsmouth), HMS Sultan (Gosport), HMS Vernon (Portsmouth), HMS Pembroke (Chatham), Forton Barracks (Gosport), Royal Marines Depot (Deal) and Commando Training Centre RM (Lympstone). The number of VCC units has decreased over the last few decades as the Naval estate, particularly in the Portsmouth area, has shrunk. A number of units merged with the Royal Marines Cadets in Forton Barracks converting to RN Cadets in HMS Sultan and the Royal Naval Cadets of HMS Nelson and HMS Excellent converting to Royal Marines Cadets when the Portsmouth Division of the RMVCC re-located firstly to HMS Nelson in 1991 and then HMS Excellent in 2000. However, the Royal Naval Cadets of HMS Excellent were ‘stood-up’ again in September 2016 as a sub-section of the RMVCC Division there. Today the VCC is still a thriving Navy Cadets organisation under the command of Commander Core Naval Training and Recruiting and sponsored by the Second Sea Lord. The current units are based at HMS Collingwood, HMS Excellent, HMS Sultan, Royal Marines Stonehouse and Commando Training Centre, with new units planned to open soon at 45 Commando RM in Arbroath and HMS Seahawk at RNAS Culdrose in Cornwall. You can read more about the history of the VCC on our Royal Marines Cadets and Royal Naval Cadets pages. The traditional crest of the Volunteer Cadet Corps represents our heritage as well as defining our future. The Naval Crown represents our links to and sponsorship by the Royal Navy; the garter belt holds our title and surrounds our Corps Colours being two-parts white (signifying the freshness and hope of youth), two parts blue (representing the Royal Navy) and one part green (denoting the Royal Marines connecting in the VCC and being central as it was at a RM barracks the VCC was first created); the torch of knowledge represents that we wish to help develop our young people and help them acquire new skills as they prepare for life, and the scroll displays our motto, Meet the Challenge, in Latin. If you have some memories, photographs or other material from the history of the VCC (irrespective of which unit) please email us at ports-admin@rmvcc.org as we would be delighted to see them and, with your permission, share them on our website. Ownership of copyright of any images and articles is acknowledged by the VCC and such material is used here in good faith for the benefit of our charitable youth organisation. Should any owner wish any material to be removed please contact us and we shall be happy to oblige.